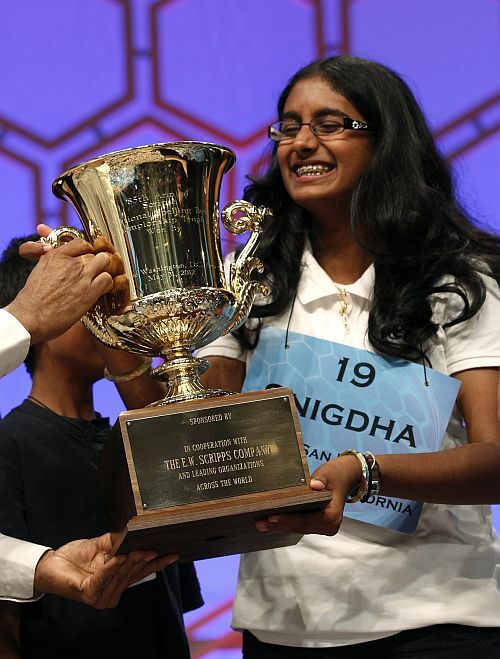 That Indian American kids rule when it comes to the National Spelling Bee, particularly in the last two decades, was manifest on Thursday night when Snigdha Nandipati, a 14-year-old from San Diego, California, became the fifth consecutive Indian American to win the Scripps National Spelling Bee competition and the tenth in the last 14 years. Nandipati, an eighth-grader at Francis Parker School in San Diego who was making her second Spelling Bee appearance in her final year of eligibility, clinched victory by correctly spelling the French derived word, 'guetapens' (which means ambush, snare or trap). She beat fellow Indian American Stuti Mishra, also 14 and an eighth-grader from Holy Trinity Episcopal Academy in West Melbourne, Florida, who in the previous round had misspelled schwarmerei as schwermerei. In the final round, Nandapati correctly spelt arrondissement. In the earlier 11th round of the finals, both Nandipati and Mishra had correctly spelt admittatur and chionablepsia respectively. In 2011, Nandapati had tied for 27th place and Mishra had tied for 19th place. Like the clean sweep by Indian American kids the previous week, when they took the first four places in the 2012 National Geographic Bee, it was yet another steamroller sweep by the Indian American kids with Arvind Mahankali, 12, of Queens, New York, finishing third. Mahankali met his waterloo in the 10th round of the finals when he failed to correctly spell schwannoma, instead misspelling it as schvonoma. Mahankali had participated in the 2010 and 2011 Bees, tying for 9th place and 3rd place last year, and when he came a cropper with schwannoma, was accorded a sustained standing ovation. 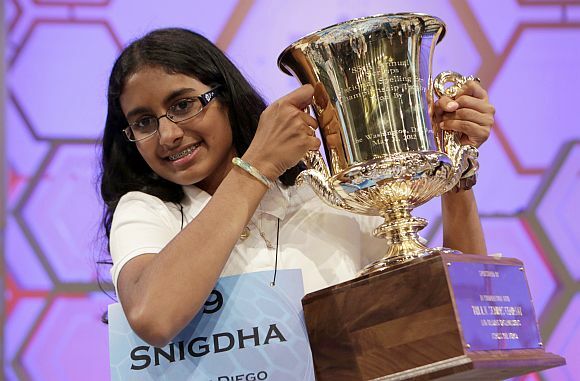 Nandapati, by winning this 85th Scripps National Spelling Bee, besides the massive engraved Scripps trophy, will be the recipient of a surfeit of prizes, including $30,000 cash prize from Scripps, a $2,500 US Savings bond and a complete reference library from Merriam Webster, a $5,000 scholarship from Sigma Phi Epsilon Educational Foundation, and a $2,800 in reference works and the Britannica Test Prep Precocious Programme valued at $799 from Encyclopedia Britannica. With confetti raining down on the gargantuan Washington National Harbor Convention Centre, where the competition was held over the past four days, and her parents, grand-parents and her younger brother hugging her, Rich Boene, chairman and CEO of Scripps, declared, "Snigdha, on behalf of all of us at Scripps, it's our honour and thrill to declare you champion of the 2012 Scripps National Spelling Bee. Congratulations." Then when a reporter with sports channel ESPN asked Nandapati what she thought when she first heard the final world, pat came the reply: "Guetapens. I knew it. I have seen it before. (But) I just wanted to know everything I could before I started spelling." She had kept asking the judge for the word's origin, its pronunciation, what kind of an adjective it was and so on. As to the question of how she feels, Nandapati said, "It's a miracle." Nandapati, who said that her role model was the 2009 Spelling Bee winner Kavya Shivashankar of Kansas, is a voracious reader of random facts in enclycopedias, particularly those topics pertaining to science or history. In her spare time, she likes to read whodunits and adventures, and she collects unique coins from around the world. Nandapati, who speaks fluent Telugu, loves to play the violin and hopes to one day become a psychiatrist or neurosurgeon, has competed in the Science Olympiad and earned several medals. At her school, Nandapati is a member of the math club, MATHCOUNTS, Math Field Day and other math-related events, besides attending the San Diego Math Circle each week. Way back in 1985, Balu Natarajan of Chicago, and today a physician specialising in sports medicine, was the first Indian American to win the title. In 1988, Rageshree Ramachandran of Sacramento took the title, followed by Nupur Lala of Tampa, Florida in 1999, George Thampy of St Louis, Missouri in 2000, Pratyush Buddhiga of Colorado in 2002, Sai Gunturi of Dallas, Texas in 2003, Anurag Kashyap of San Diego, California in 2005, Sameer Mishra of Indiana in 2008, which started the deluge with Shivashankar winning in 2009, Anamika Veeramani of Ohio in 2010, and Sukanya Roy of Pennsylvania in 2011.